So you consider yourself a reader of the Brontës? Of course you've read Wuthering Heights, Jane Eyre, and The Tenant of Wildfell Hall. (Find these classics in our collection of Free eBooks and Free Audio Books.) You've probably even got on to the likes of The Green Dwarf and Agnes Grey. Surely you know details from the lives of Charlotte, Emily, and Anne. But have you read such lesser-known entries in the Brontë canon as Scenes on a Great Bridge, The Poetaster: A Drama in Two Volumes, or An Interesting Passage in the Lives of Some Eminent Personages of the Present Age? 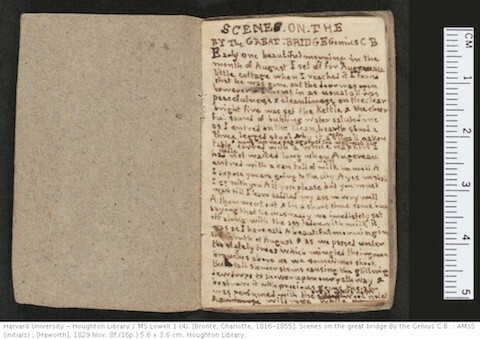 Do you know of Brontë brother Branwell, the ill-fated tutor, clerk, and artist, and have you seen his own literary output? 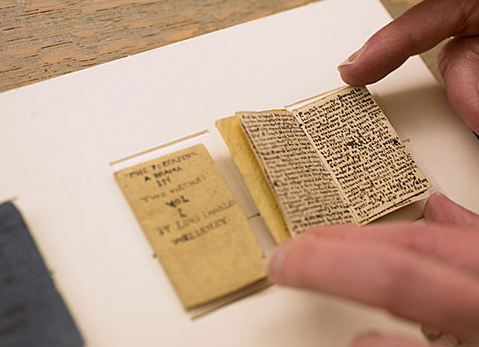 Now you can, as Harvard University's Houghton Library has put online nine very early works from Charlotte and Branwell Brontë — all of which measure less than one inch by two inches. Are the books housed in the Houghton Library?